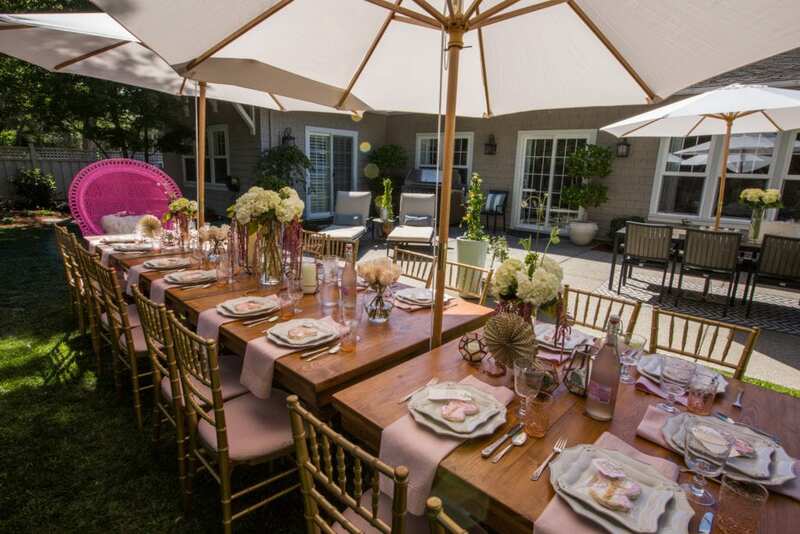 Two years ago I hosted a Garden Bridal Shower for my niece, Maddy in my backyard. 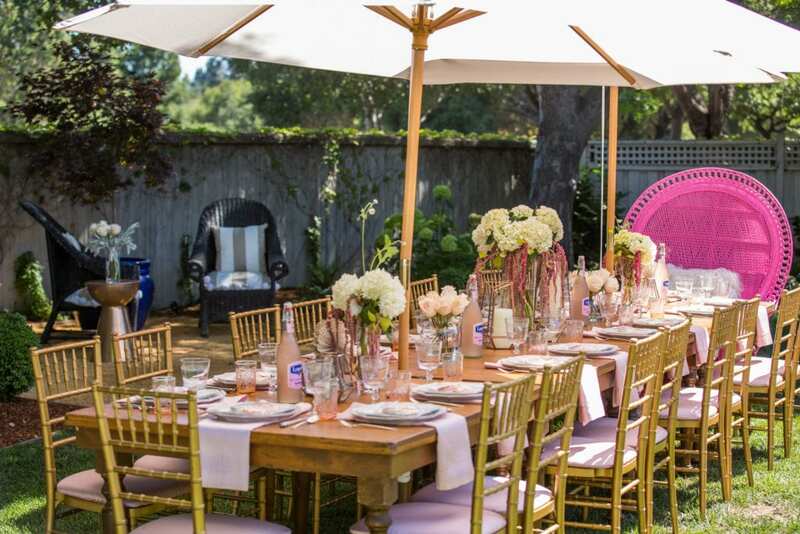 It was so much fun to create this fun and super girly brunch to celebrate such a wonderful occasion! I loved putting together all the details and being able to create such a memorable event for someone who feels like my little sister. Wedding Season is upon us! I love seeing all the gorgeous tablescapes and new ideas for weddings all over pinterest. It feels like ages ago that I got married and was planning our nuptials down in Laguna Beach. It was before Pinterest and all you had for inspiration were bridal magazines, ha! 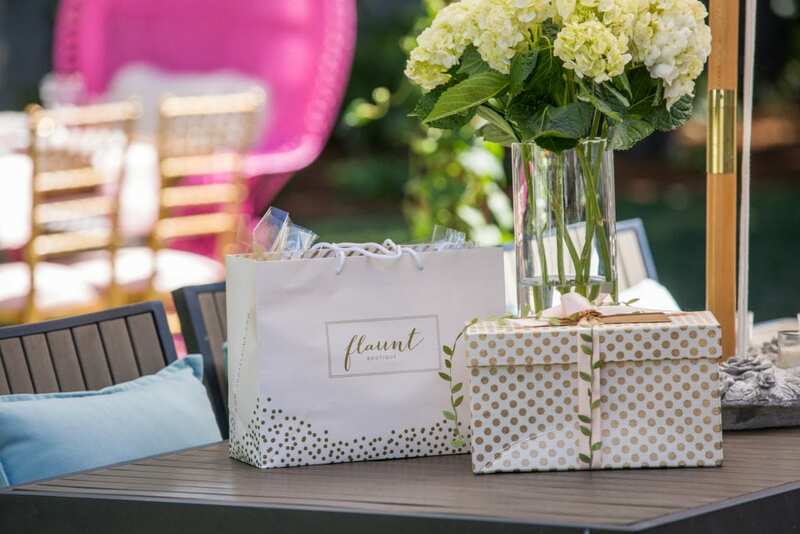 When I started searching for ideas for this garden bridal shower, I knew I wanted it to be casual yet elegant. I wanted to hold it in my backyard set in the garden. I had guests enter the party through my side yard garden. 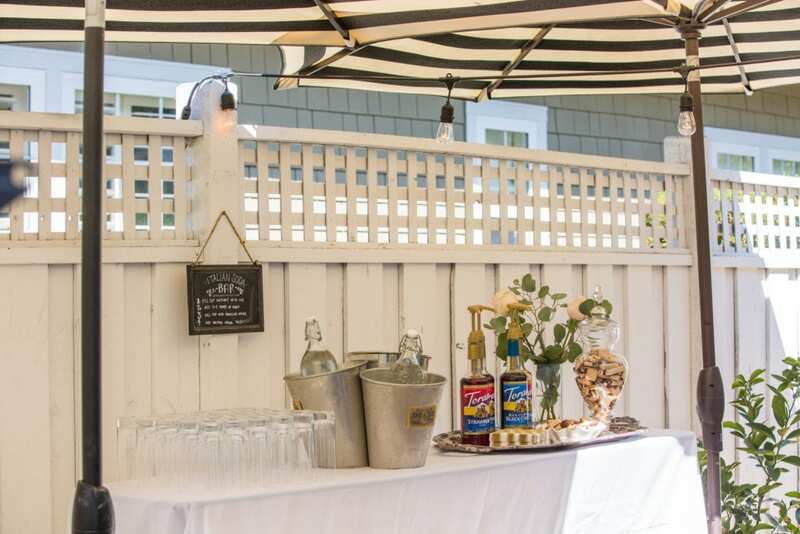 When they entered through the gate, I had a DIY Italian Soda Bar set up for guests to create their own drinks and nibble on small bites. 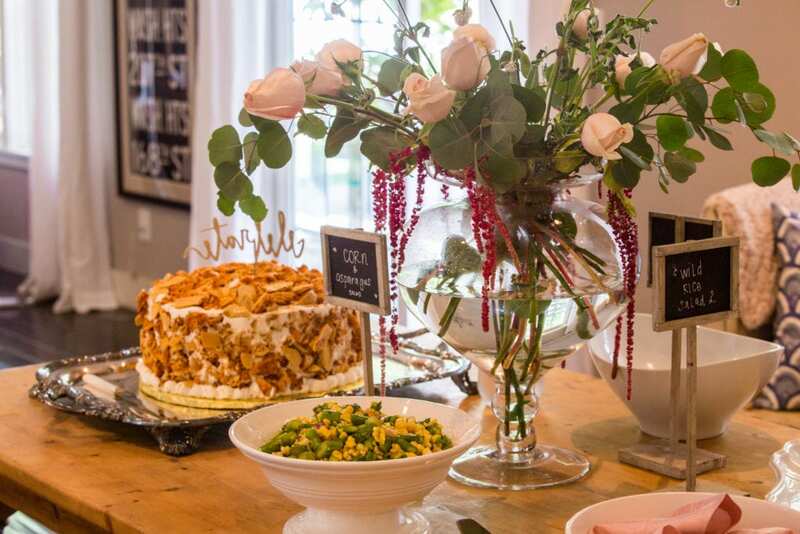 The guests loved being able to create their own flavors and it was a great conversation starter! Creating this Italian Soda Bar was so simple. I purchased different flavored syrups from World Market. Just provide the club soda, cute straws and ice. I had directions on how to make your own soda written on a small hanging chalkboard above the bar. Fill your glass with ice. Add 3-4 pumps of your favorite flavored syrup. Add sparkling water and stir! Now you have your own customized drink! 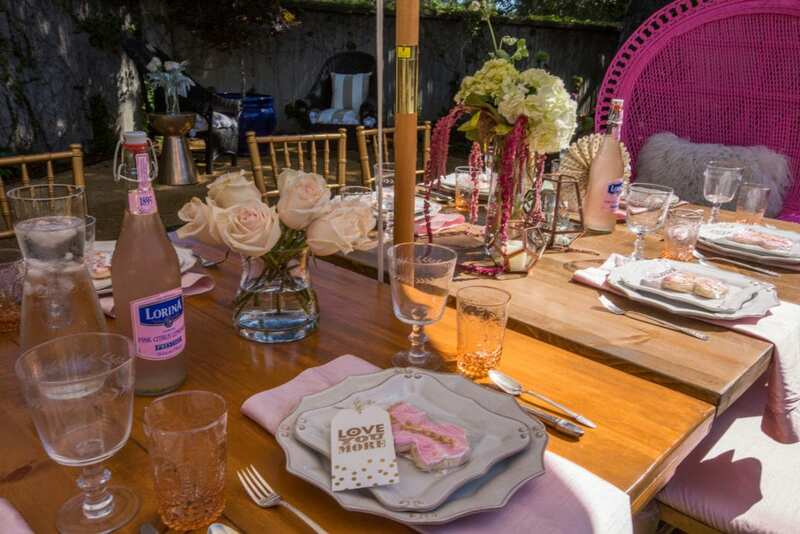 If you are looking for something stronger for your bridal shower, my Blushing Pink Gimlet would be perfect for the occasion! 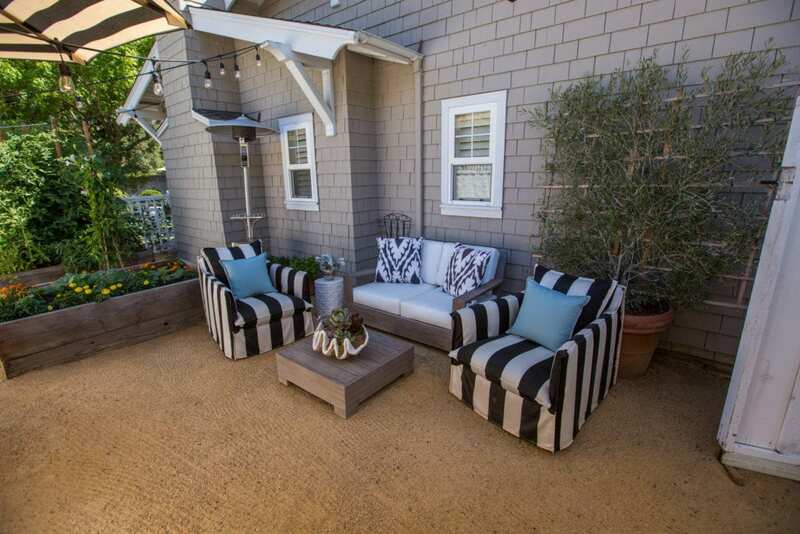 A great way to keep people mingling and from tanning around in a circle is to create lots of different areas for guests to sit. 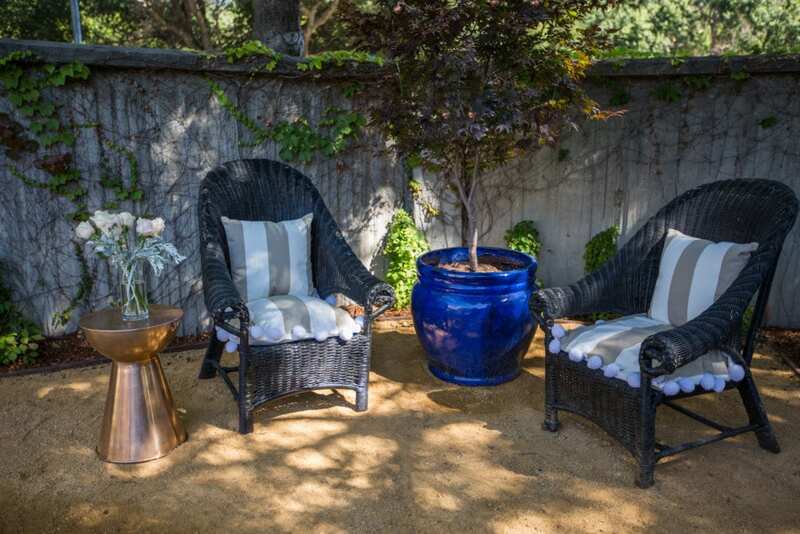 It’s important to make sure there are plenty of places to sit and talk so guests feel comfortable and relaxed. 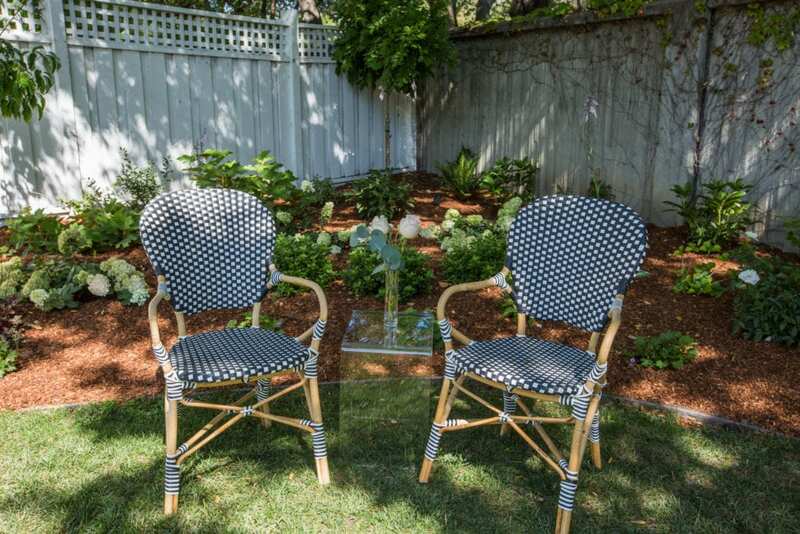 I brought out furniture from different rooms inside my house to create conversation areas throughout the yard. It also creates a more cozy and relaxed environment! I knew when I started planning this shower that I wanted to have wood tables for the brunch. 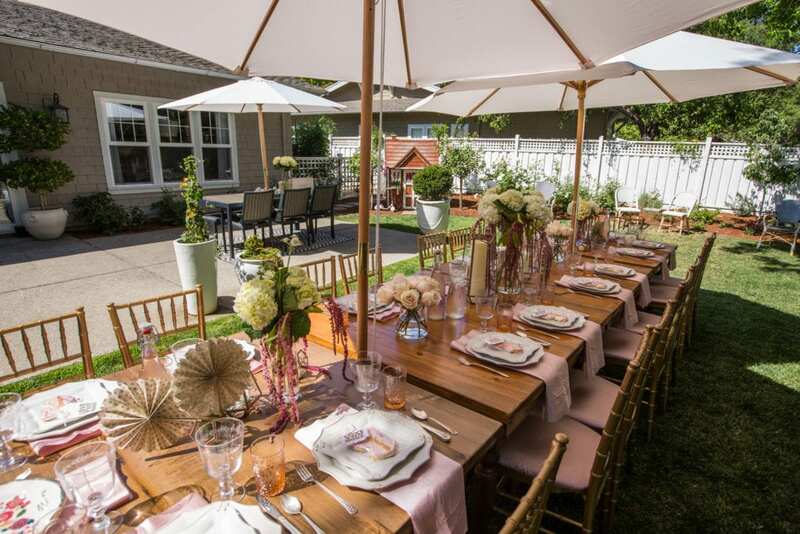 I rented these square farm tables from a local rental company here in the SF Bay Area. 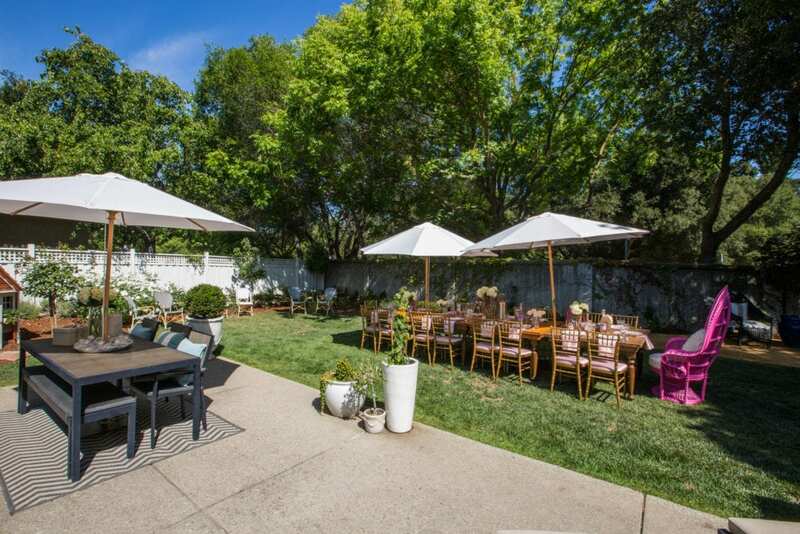 Don’t you love the look of having these rustic wood tables on the lawn? 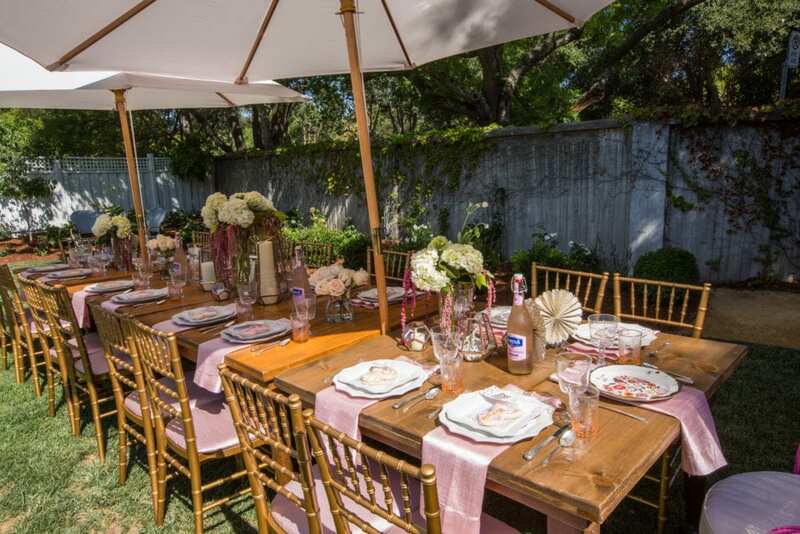 The rental company provided the tables, chairs, linens, glassware and plates. 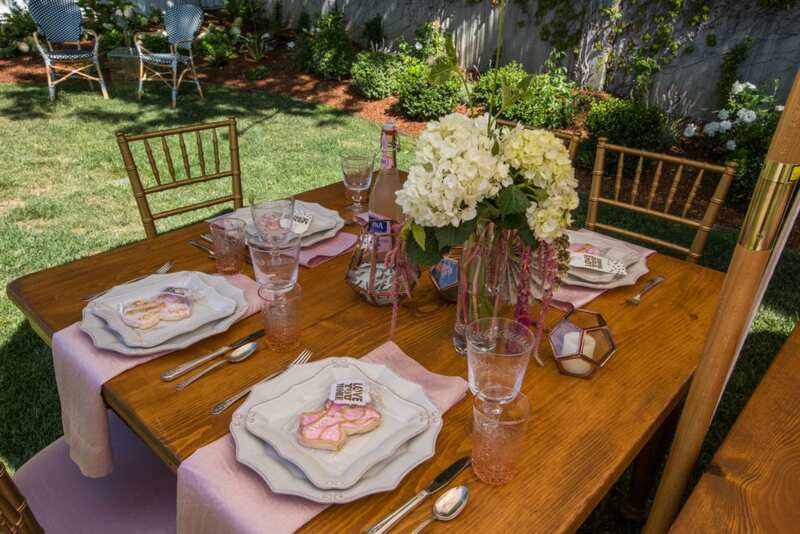 It was so fun picking out all the details for the tablescape. And the cleanup was so much easier! One of my favorite parts was being able to incorporate my mom’s vintage silverware. It added the perfect personal touch. For flowers, I went to the flower mart in San Francisco and picked up all the blooms and made the arrangements using varying sized vessels. 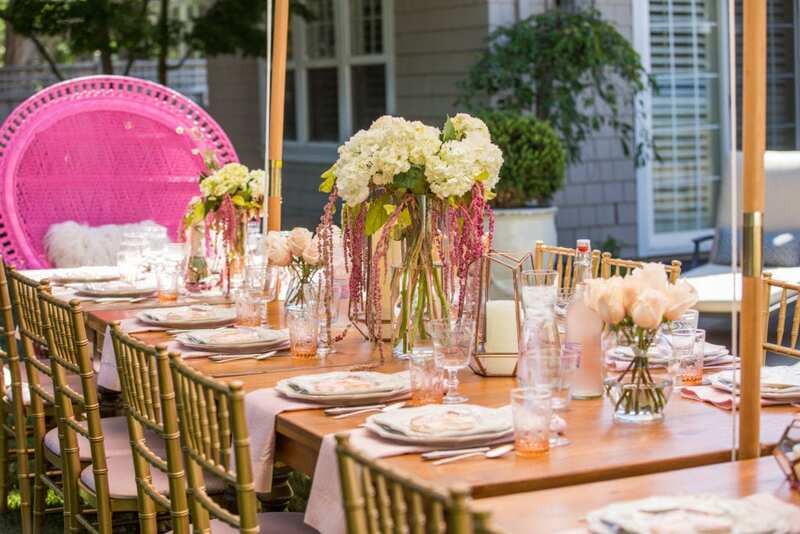 Each arrangement used a combination of hydrangeas, blush roses and a cascading pink flower. I also incorporated candles along the table. I found a baker on Etsy and had her make these custom corset cookies. She customized them with the events color scheme, which was pink and gold. I thought it was fitting for the bridal shower, don’t you think? I made gift tags using an embossing tool and a rubber stamp that said “Love You More”. 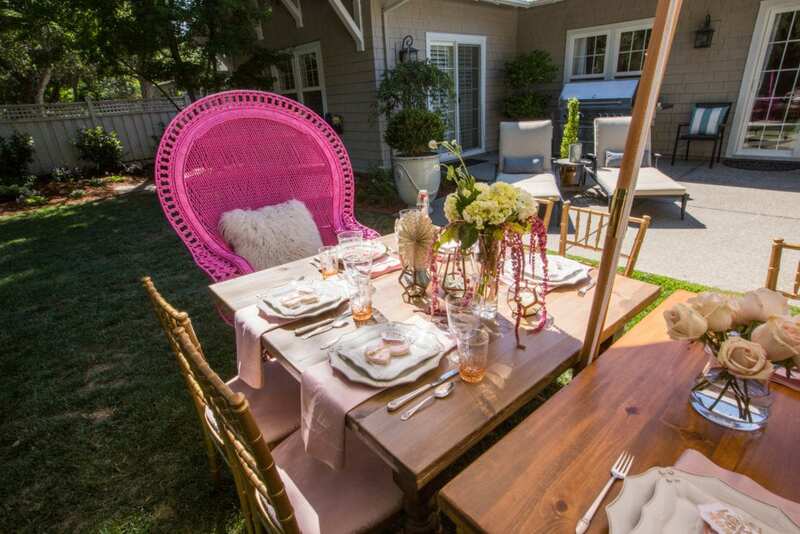 And I brought this fun pink rattan peacock chair outside from my daughter’s room to be the guest of honor’s seat. Seriously, how cute is it at the head of the table? It was the perfect final pink touch! For decoration on the tables I found paper fans at PaperSource and rose gold lanterns from Anthropologie. I filled the lanterns with candles and also greenery. 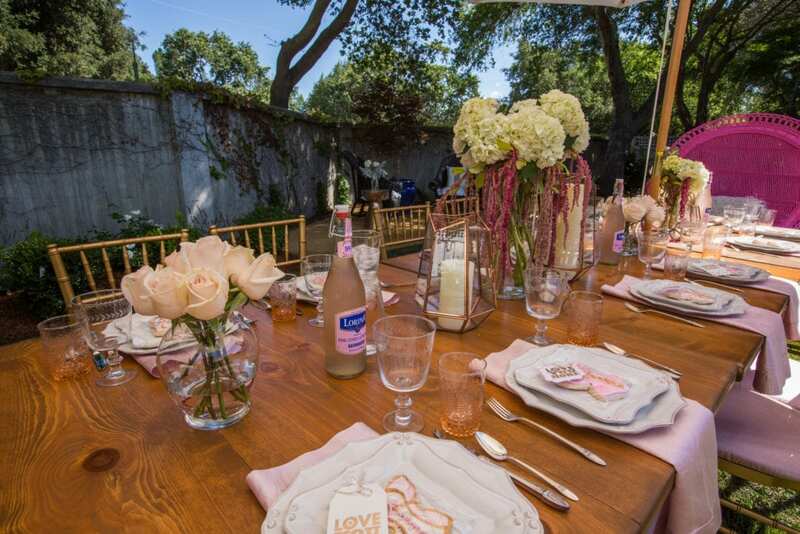 And something as simple as pink lemonade in cute bottles helps add some girly pink touches to the table. Lunch was served buffet style with an assortment of salads, perfect for the warm summer day. This cake was such a showstopper! 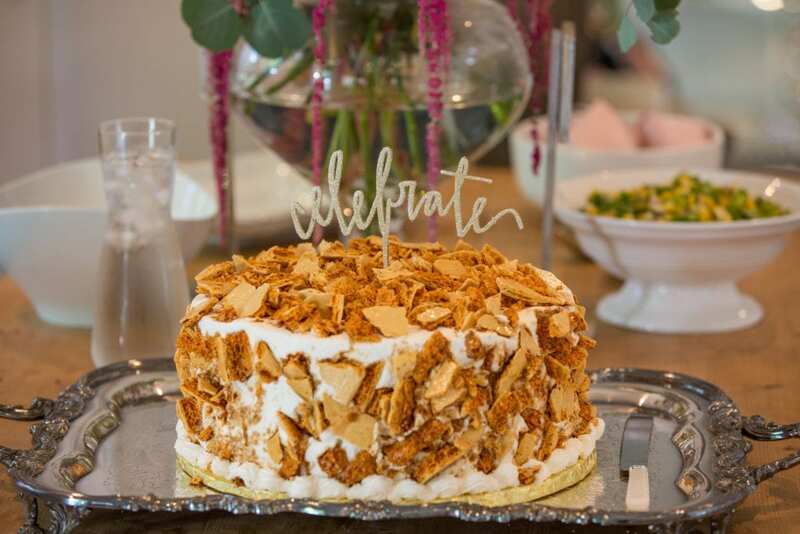 Vanilla cake layered with fresh whipped cream and coffee crunch candies. From local bakery, Le Gateau Elegante. 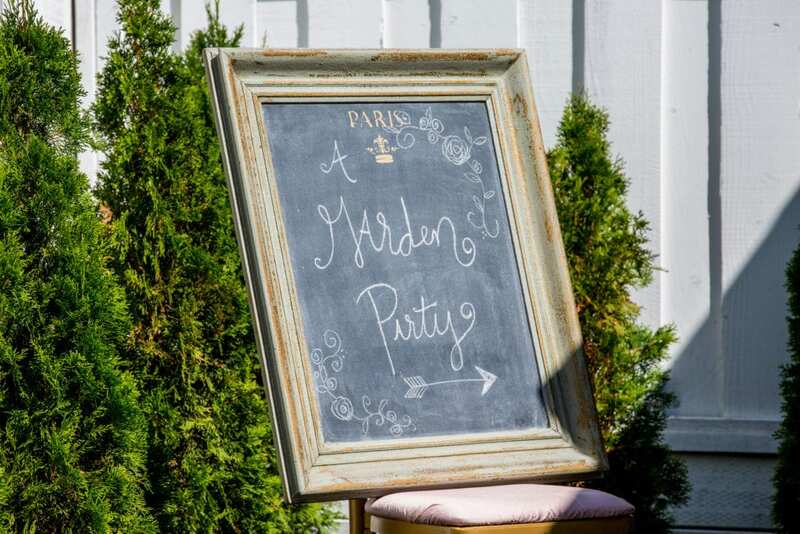 This bridal garden party was so much fun to plan! 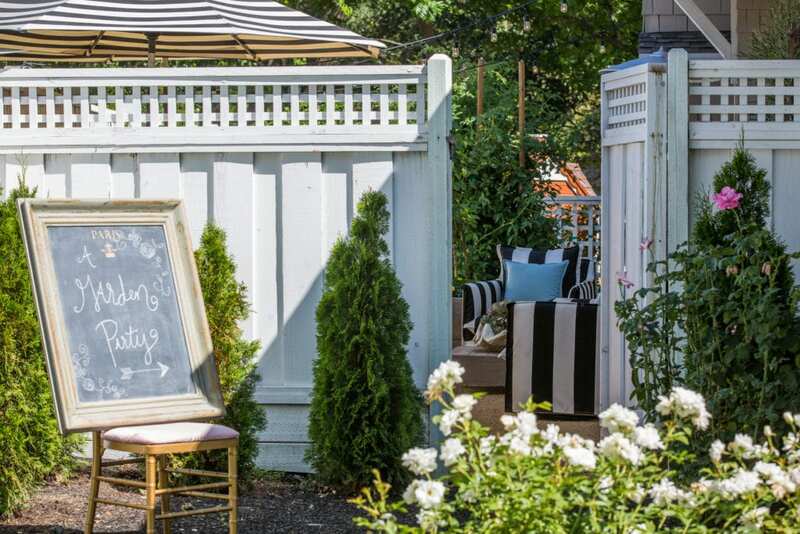 I hope this gives you some inspiration for your next garden party! Simple details that have an impressive impact!